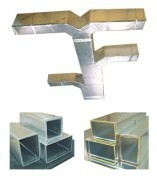 Rectangular ducts and fittings are mostly implemented in places where big amount of air is needed. Our clients buy mostly metal products, but we also have material boards for folding. Clients are given variety of choice, so they can select the suitable one. Our manufacturer offer metal sheet elements on galvanized metal, aluminum and acid resistant type.